Kerry Tribe, La Brea Avenue north of Venice Boulevard, Los Angeles, February-March 2010. Part of "How Many Billboards? Art in Stead" temporary project organized by the MAK Center for Art and Architecture. 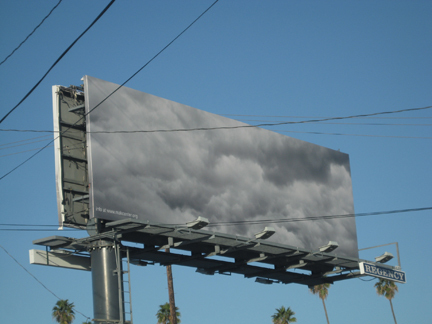 "Tribe's billboard gives the viewer a mental break from the onslaught of visual imagery to simply ponder what the image might be, and what purpose it may serve. " - text from a longer description by Gloria Sutton, http://www.howmanybillboards.org/, accessed 03/2010.